You know these guys, right? They have been a hanging out at SeptemberHouse for a few years and I get asked about them all the time. 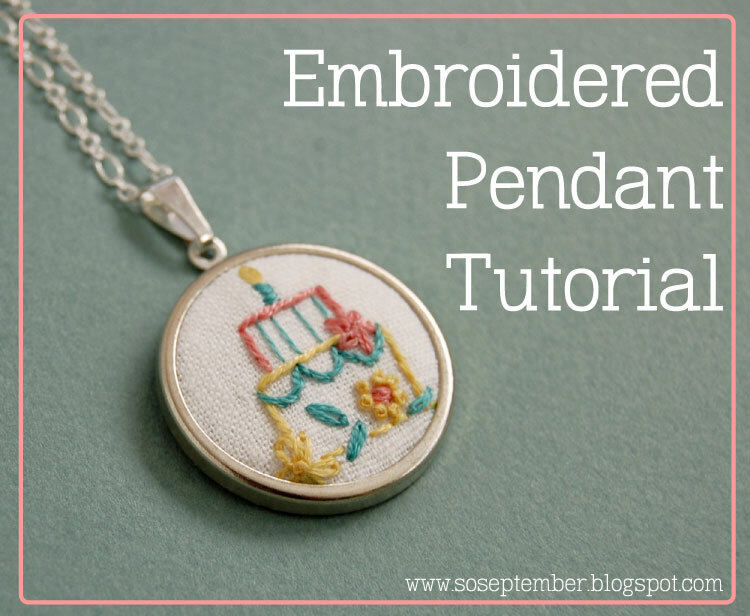 I thought these embroidered pendants would make a good tutorial to share for the "Stitch-tember" festivities. And yes, I am opting for a birthday theme. My SeptemberHouse birthday is coming up very soon (it will be 4 years - can you believe it?) and September is a huge month for birthdays in my family so we are always knee deep in birthday cake around here. I chose a cake image but you can use whatever you like for your necklace. 1. Here's what you will need: one pendant setting available at one of my favorite little Etsy shops, Kailea. She has lots of sizes and shapes to choose from and she is lovely to work with too. Each pendant setting comes with an outer open frame piece, and inner solid circle that supports your fabric and a solid backing piece that covers the fabric on the back side. You'll also need a small piece of fabric. Just 3 x 3 inches works fine for this project. I also use some iron-on interfacing on the back to give the embroidery a smoother look and to eliminate any glare from the metal piece underneath. 2. Just trace the inner circle from the setting onto your interfacing and cut it out. 3. Next you'll need to iron the interfacing onto the back of your fabric. Next choose a design you want to stitch onto your pendant. I used a birthday cake pattern and guess what? That pattern along with three other tiny birthday cakes are available for download. They can be used for this project or any other personal project requiring a teeny tiny birthday cake image. Click on over to get the free embroidery pattern. 4. Transfer your design using whatever method you like best. I used a water soluble marker and a bright window. 5. Stitch away! I love this part. 6. Using a running stitch, stitch all the way around the circle about a 1/4 away from the interfacing. 7. Trim another 1/4 away from that. 8. Place the inner metal circle over your embroidered circle on the back side. 9. Pull the ends of your floss to cinch your fabric around the metal circle. Double check the front side to make sure it is positioned correctly. 10. Insert this into the open metal frame and turn face down on a table or working surface. Making sure all the fabric is tucked in, carefully add the backing piece to the back side. Turn the metal prongs down to secure (I use needle nose pliers for this). To finish it off I snip the floss ends and use a needle to tuck in any bits that can still be seen. You can add any chain you like to complete your necklace. I should be sure to say that this is how I have made these embroidered pendants but there may be other methods out there that work just as well or even better. Let me know if you have any questions about this project - I'm always happy to help! If you haven't entered the calendar panel giveaway be sure to stop by and do that before Friday. More exciting Stitch-tember events to come! adorable! I want to make one now. Thank you so much for this post. I want to let you know that I posted a link to your blog in Creative Busy Bee Craft Inspirations, under the Page 4 post on Sep. 06, 2012. Thanks again. Thanks! I just order the small circle and oval!! Lovely, thank you for this. I have just come across to your blog from Michelle's Romantic Tangle and will be back to visit again. But I've finally started on needlepoint and I'm glad to see that years of working on pixel art have paid off! Oh and where ever did you get that pendant!? where can I purchase the materials for this project? where else can i buy the pendents, if i was going to make more for gifts? this is so cute. i ordered one yesterday and i can't wait for it to get here! Can the pendant setting be bought at Michael's? I'm pretty sure I've seen something similar, but I wanted to check first. WOW So beautiful! What a great idea, thanks for sharing the tutorial and the inspirational blog. This is such an awesome tutorial! Thanks so much for sharing :) Just want to clarify though -- in step 10, do you tie the floss ends or just snip them off? I'm thinking you just snip them off :) TIA! Yes, I just snip them off and then tuck them under the metal backing piece with a needle so they are completely hidden. :) Thanks for asking about this - I hope you enjoy this project! Your tutorial was mentioned on our blog today in a post about embroidery. Thanks so much for this tip!